Grand Cay Villas condominium in Ponte Vedra Beach, Florida. Grand Cay Villas is a wonderful gated condominium community in desirable Ponte Vedra. Grand Cay Villas is located next door to the Tournament Players Championship (TPC) golf course at Sawgrass, the Association of Tennis Professionals (ATP) tennis headquarters, the Bolles elementary school, and Marriott hotel at Sawgrass. 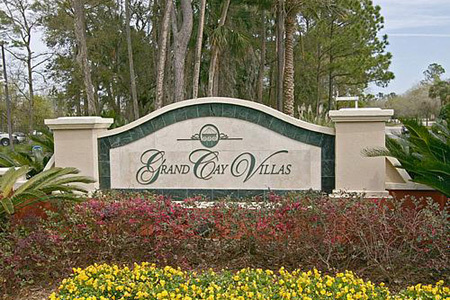 Grand Cay Villas offer affordable condominium homes without the Ponte Vedra price tag. Choose from three available floor plans with one, two and three bedrooms. Some of the units have garages. Amenities include clubhouse with kitchen, pool, fitness center, children playground and car care center. Recreational activities are abundant in Ponte Vedra and include watersports, fishing, beachcombing, tennis, and planned social events. Ponte Vedra offers some of the finest golfing and golf courses in the world such as the PGA Tour Headquarters, the TPC Stadium Course at Sawgrass, the World Golf Village, the World Golf Hall of Fame, as well as the home of the Association of Tennis Professionals. Just a short drive from Ponte Vedra in Jacksonville, you will find over 30 challenging golf courses; beautiful parks; the Cummer Art Gallery; the Florida Theater; the Performing Arts Center, home of the Jacksonville Symphony Orchestra; EverBank Stadium, home of the Jacksonville Jaguars and many other cultural and recreational outlets. Don't miss your opportunity to live, work, and play near the Beaches. Call me today at (904) 307-8998 for your personal tour of Grand Cay Villas.